Attention deficit hyperactivity disorder; by simply putting the word ‘disorder’ in the name, you are destroying a child. You’re labeling them as different, and adding to the social anxiety that already comes with ADHD. You’re making them feel as if the emotions that they want to show are wrong. Yes, they are different, but being different isn’t necessarily a bad thing. The simple fact of the matter is this; if more people could show the type of emotions that ADHD people do, this world would be a much better place. So tell me, is ADHD a disorder, or a gift? Putting a label like ‘different’, ‘disorder’, ‘handicapped’ or ‘special’ on a child does nothing more than slowly destroy the person they truly are. It pushes them further into their shell, and not only that, it can also used as an excuse for bad behavior. The fact is a person with ADHD can learn to control their actions. But unfortunately, more often than not more parents use the ADHD label as an excuse for bad parenting and not teaching their children right from wrong. When their child misbehaves they simply chalk it up to the disorder, instead of using it as a learning experience. A child is not going to learn right from wrong and how to behave unless their parent explains it and, most importantly, leads by example. This dynamic is similar to so many abusive relationships. A man gets into a relationship with a woman and calls her names and breaks her down until she actually starts believing what he says. And then she becomes that person. It hardens her, it makes her less understanding and more combative towards people who don’t understand. It makes her feel like everyone else is better than her, destroys her self-esteem. This happens in adult relationships, so how might a child be impacted when their parents, teachers, and doctors calls them names like ‘different’ or ‘handicapped’? 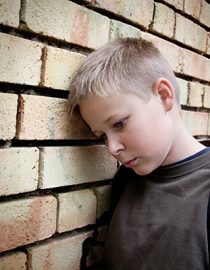 So often it causes depression, especially as the child gets older and becomes a teenager. And then doctors label it a ‘mental disorder’. If said you were different from all of your peers and told you had a disorder, wouldn’t that be depressing to you? You know it takes you longer to figure things out, but the solutions you come up with are better solutions than anyone else’s. Look at the average person’s mind like a box. It’s closed, and in that box is all the ideas that person has. The ADHD mind is the area outside the box; it’s infinite. It’s constantly pursuing new avenues. It’s constantly exploring and trying new things. Growing up I struggled with the basic things – the more complex something was the better I did. Problem-solving has always been something I could master. If you gave me a problem and the tools I needed, I would find you the best solution. Next page: looking at things differently continued and changing your perspective. Kevin is a father with ADHD. He is passionate about his children, the youngest of whom has ADHD as well. In his free time Kevin enjoys skydiving and writing jokes for a Facebook page called Only in Oklahoma.